The eye, or loop, in an eyebolt is used to guide a cable, rope, or chain for lifting purposes; to guide wires in an electronic system; or for use as tie-downs in a number of applications. Eyebolts are rated for lifting different vertical loads and are generally made of aluminum, steel, or titanium, which are all strong and durable metals, able to maintain their shape under pressure. Eye bolts may be categorized as open or closed, depending on whether the eye forms a complete circle, or if there is an opening at any point. Closed, or turned, eye bolts may be welded together at the joining, while in open eye bolts the opening is typically the same size as the diameter of the bolt rod itself. 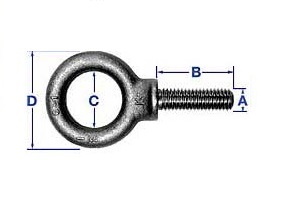 Furthermore, if an eyebolt is constructed with a shoulder, it is able to be used for angular loads, making it useful in rigging and lifting applications. If it does not have a shoulder, it should be used for straight, light-weight loads that will not pull on the bolt from an angle. 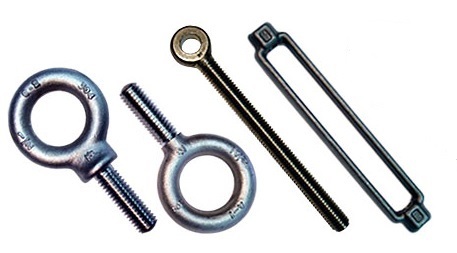 For lifting loads and providing anchor points, industrial bolts can be made of a number of different materials. Stainless steel bolts and galvanized steel bolts are among the most common. Of the materials typically used to construct eye bolts, aluminum is the lightest and so is used in applications which are not heavy-duty. Titanium may be used in specialized applications such as aerospace or scientific. Steel however, has very good load ratings and so both steel and stainless steel are used in a wide range of bolting options for industries such as building construction, marine, architectural and rigging. Stainless steel is used in environments where exposure to moisture and high temperatures is expected. It is a strong metal with high corrosion resistance properties and therefore it will be able to last, even in extreme environments. Galvanized steel is not as resistant to the elements, but it is still strong and durable and is suitable for a number of basic lifting and anchoring applications. Galvanized steel bolts also tend to be cheaper than stainless steel bolts and therefore offer a cost-effective alternative. Eye Bolts Eye bolts are bolts with a thread at one end and a circular shape or "eye" at the other in place of a standard head. Bolts, also sometimes referred to as screws, are components used to fasten objects together and are typically required to endure a certain amount of tension or stress.